The Pueblo West Metropolitan District hired some new crew in 2017 to help with water leak detection. These two new staff members will be responsible for water leak detection and repairing the leaks along the 430 miles of potable water lines that run underneath Pueblo West. Because shale rock formations, just under the ground surface in Pueblo West, many leaks can go undetected for long periods of time, said Jay-Michael Baker, communications and engagement manager with the Pueblo West Metropolitan District. The water lost in a leak can follow these formations for hundreds of feet in some cases, and then only reach the surface in drainage ditches out of sight of the everyday operations staff and most residents. “In one recent case the water from a main line leak found its way into the sewer system,” Baker said. Since the leak flowed into the wastewater treatment system, it not only increased the cost of the lost water, but it also increased the cost of treating the extra water. Detecting and repairing this leak saved the District a significant amount of money. “I am very pleased with the work of the entire Collection and Distribution department,” said Scott Eilert, director of Utilities for Pueblo West. 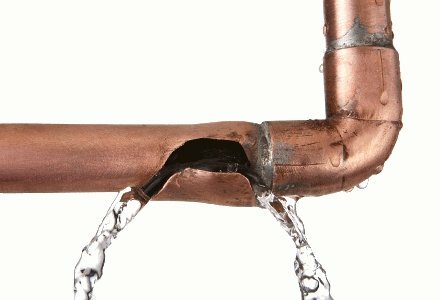 The leak detection crew has located and repaired 10 significant leaks since last October. The leak detection crew is credited with saving the District 480,685 gallons of treated water; enough to serve the average use of three single family homes for an entire year, Baker said. “It is impossible to know exactly when a pipeline began to leak so we calculate the lost water from the date and time the leak was located until it was fixed,” Baker said. Since the leak detection crew came in to service in October 2016, the approximate cost savings to the District for leak detection has been in the tens of thousands of dollars, he said. In addition to the District’s recent water conservation plan, Pueblo West is conducting telecommunications and energy audits this year to identify waste, and decrease inefficiency. Operating with a lean budget, any cost-savings that Pueblo West Metro management staff can find improves the quality of services provided to residents, he said. Because the Pueblo West Metropolitan District looks for ways to increase efficiency and prevent waste within the district, finding solution through regularly reviewing processes and weak points is highlighted, he said. The District’s water conservation plan, approved by the Colorado Conservation Board in August 2012, ranked leak detection as a high priority, Baker said. In response to this recommendation, the Pueblo West Metro Board approved two new full-time positions dedicated to leak detection for the 2016 budget year. When Pueblo West residents opened their water bill from the September billing cycle, they said they were aghast at the price hike. Some said it was a significant enough increase that they called the Pueblo West Metropolitan District with concerns about water leaks. Officials with Pueblo West Utilities held a community meeting on Nov. 29 to answer questions from the public about the water rate increases and about the five-year water and wastewater rate plan. Residents questioned where and how the water fees applied to their monthly bills and costs associated with sewer charges and leaks. Kim Swearingen, deputy director of utilities for Pueblo West, said the bill period begins around the 10th of the month, give or take holidays, and go through a 31-day cycle. For example, she said, the water bill would begin on Oct. 10 and end on Nov. 11. The data from the reading would be analyzed by Nov. 26 and the bill would be sent out and due in December for the October billing cycle. “It’s almost like a three-month (billing) cycle but it only looks at that 31-day billing period,” she told residents during the meeting on Nov. 29. The Pueblo West Metropolitan District Board of Directors will hold a final public hearing on Dec. 12 to approve a Water and Wastewater rate increase that will take effect Jan. 1. The increase is part of a long-range comprehensive financial plan that was first initiated in March 2016 and partially funded by the Colorado Department of Local Affairs. The plan recommends a five-year phased implementation that accounts for five years of operations and maintenance costs and a 10-year capital improvement plan. The 10-year capital improvement plan lays out all long-term infrastructure needs for the Utilities Department. The intent of the plan is to ensure the Utilities Department has sufficient revenues for the ongoing functions of the water and wastewater enterprises. Inflation-induced increases in operating and maintenance costs, aging infrastructure, and long-term planning were all factors covered in the long-term financial plan. The Utilities Department presented the increases to the Board of Directors at over a half dozen Board Meetings over the past two years. Scott Eilert, director of utilities for Pueblo West, offered examples of projects to receive funding include: a gravity sewer main that serves Tract 220 and the large lot on the northwest corner of Highway 50 and McCulloch Boulevard, a lift station and force main at States Avenue Industrial Park, the rebuild of a pressure zone on Tract 251, a two million gallon water tank on the north side, and wastewater treatment plant upgrades, in addition to dozens of smaller capital projects. On Sept. 1, the first phase of the rate increase went into effect resulting in an increase of approximately 4.6 percent for an average single-family monthly bill for both water and wastewater. On Jan. 1, the second rate adjustment will take place with an estimated increase of 4.7 percent for an average single-family monthly bill. The remainder of the plan adjustments are intended to take effect on Jan. 1 of each year through 2021 after the public hearing. The water and sewer Plant Investment Fees saw a one-time increase on Sept. 1 and the district does not anticipate adjusting the PIF again within the five-year plan, Eilert said. The master plan contract is between the Bureau of Reclamation and the water district, and Pueblo West now has a subcontract with water district for its storage rights. The contract allows Pueblo West to begin paying for 10 acre feet, at the starting rate of $40.04 per acre foot of water, in 2017. But the contract gives Pueblo West the ability to store as much as 6,000 acre feet of water in the future should the storage ability be necessary. You could sit all day and stare at the Pueblo Dam and not have a clue about why it’s there, who built it and what it’s for. Or, if you’re lucky enough to be a fourth- or fifth-grader in Pueblo County, you could spend a day filled with fun activities and learn everything from water safety to the water cycle — including the Pueblo Dam and the kitchen sink. The Children’s Water Festival began in 1999 and continues each year since, except for 2015, in early May at Colorado State University-Pueblo. About 1,800 fourth- or fifth-graders attend each year from Pueblo City Schools (D60), Pueblo County School District 70 and private schools. In 2015, the festival was canceled, ironically, because of weather. It was wet and cold the entire month of May, but the big concern was the possibility of thunderstorms. The 2016 program was geared for fifth-graders, who had missed their chance as fourth-graders last year. “The kids have always enjoyed it,” said Linda Hopkins, a retired employee of the Bureau of Reclamation, who helped coordinate the festival for many years. She explained that the Pueblo event was patterned after the Nebraska Groundwater Festival, which started in Grand Island, Neb., in 1988. Internally, Reclamation decided a Pueblo festival would be a good idea in 1999. By then, there were a few other water festivals for children in some other parts of Colorado. Reclamation in 1999 was involved in one of its most controversial periods in Pueblo since it built Pueblo Dam in the 1970s. The dam was being reinforced to improve its stability, a move that some interpreted as a precursor to enlargement that could benefit large municipal users such as Colorado Springs and Aurora. “Part of it was to get the bureau’s name out there in a positive way, but mostly it was to expose the kids to water information,” Hopkins recalled. The idea was that the children would take the information home and discuss it with parents or other family members. Local water providers were immediately supportive, and continue to contribute resources and people each year. The festival has operated smoothly, organizing squadrons of teachers, students and parents armed only with coolers of sack lunches and a big appetite for a six-hour course of water games, lessons and contests. This year’s festival, held last Tuesday at CSU-Pueblo, was sponsored by Reclamation, the Lower Arkansas Valley Water Conservancy District, the Southeastern Colorado Water Conservancy District, the Pueblo Board of Water Works, Pueblo West and the St. Charles Mesa Water Conservancy District. CSU-Pueblo makes the entire campus available for activities. “We have a closeout meeting after the festival each year, then start meeting in September or October to plan the next year,” said Toni Gonzales, of the Southeastern district. The presenters range from high school students to water professionals. With the exception of the Mad Science demonstration — a crowd-pleasing experience that goes beyond water — all of the presenters are volunteers. “I came to one of these when I was in fourth grade,” said Tony Valenzuela, a member of the Future Farmers of America and Pueblo County High School student. On Tuesday, he was demonstrating how to set irrigation siphon tubes. The process involves coaxing water through a 4-foot metal tube by capping one end and firmly jiggling it. Farmers use the skill to flood irrigate crops planted in furrows. “Our family used to farm,” Valenzuela said. Erik Duran, fire inspector for the Pueblo Fire Department, went over a math lesson with the visual aids of 1-gallon and 5-gallon water cans and a pumper truck that can hold up to 3,000 gallons. “That hose can pump 1,500 gallons per minute, so how long would it take to empty the tank?” Duran said. Nearby, other students were solving a simpler equation as workers from Pueblo Water demonstrated in real time what happens when a pipe leaks under pressure. Water was shooting out in a 20-foot plume and the goal appeared to be finding out the minimum time running through water (while screaming) in order to soak the maximum amount of clothing. If you go to a water festival, chances are good you’ll get wet. Well, it was mostly popular because the high school students invited all the teachers in the auditorium to join them onstage in an impromptu line dance. Other outside displays demonstrated the water cycle, how to stay safe while boating or forest health. Inside, students in one room conducted a mock water court, applying Colorado’s water law to a manufactured dispute. In another, Water Wizards from competing schools answered some tough questions that ranged from global to local in scope. That’s downright cruel to a kid who hasn’t eaten lunch yet and can look forward only to the peanut butter and jelly sandwich in the cooler. Still, one young lady had the gumption to answer: 1,500 gallons? Correct, or roughly half a fire truck. Water festivals are becoming more popular. Trinidad hosted its first in 2012, at the height of a drought. Salida and Colorado Springs are looking at starting their own. After 17 years, Pueblo’s version continues to give kids a chance to soak up water knowledge. The City Council committed Colorado Springs on Wednesday to spend more than $460 million over 20 years on a stormwater projects pact with Pueblo County. 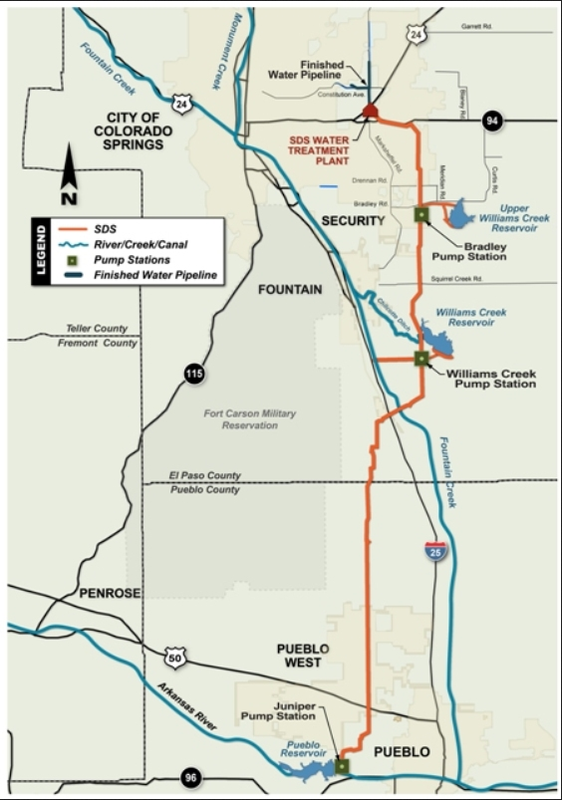 The intergovernmental agreement, negotiated chiefly by Mayor John Suthers, is expected to resolve Fountain Creek stormwater problems for downstream residents and avert lawsuits threatened by the U.S. Environmental Protection Agency through the Department of Justice and by Pueblo County. Further, the accord would allow Colorado Springs Utilities’ Southern Delivery System to start pumping water as scheduled on April 27. Pueblo County officials threatened to rescind that $825 million project’s 1041 permit, which they issued in April 2009, if the city didn’t ante up enough guaranteed funding for stormwater projects. The deal now hinges on a vote by Pueblo County’s three commissioners, set for 9 a.m. Monday. Any delay of the SDS would reduce the worth of warrants on equipment and work while leaving four partner communities – Colorado Springs, Pueblo West, Fountain and Security – without the water deliveries they expect. The council, meeting in special session Wednesday, didn’t hesitate to approve the pact. Only Councilwoman Helen Collins, a steadfast foe of government spending, dissented in the 8-1 vote. The agreement calls for 71 stormwater projects to be completed by 2035. Engineers for Pueblo County and Colorado Springs chose the projects and will review them each year to allow for fluctuating priorities. The money will be spent in five-year increments, at a rate of $100 million the first five years followed by $110 million, $120 million and $130 million. Any private developers’ projects or other efforts would be in addition to the promised amounts. If the projects aren’t completed in time, the accord will be extended five years. And if Colorado Springs can’t come up with the money required, the city-owned Utilities will have to do so. The agreement was tweaked slightly Wednesday, on request of the Pueblo County commissioners, to increase one miscalculated payment to a water district by $332, to add the word “dam” to references to a study of water-control options, and to add “and vegetation” to a clause about removing debris from Pueblo’s city levees. A clause was added to note that after the agreement expires, both sides agree to coordinate and cooperate with one another, as they always will be upstream-downstream neighbors. Colorado Springs has failed to properly enforce drainage regulations, conduct adequate inspections, require enough infrastructure from developers or properly maintain and operate its stormwater controls, the EPA found during inspections in August. The downstream victim has been Pueblo County, which saw Fountain Creek sediment increase at least 278-fold since the Waldo Canyon fire in 2012, degrading water quality and pushing water levels higher, Wright Water Engineers Inc. found during a study for the county last year. Sediment increased from 90 to 25,075 tons a year, while water yields rose from 2,500 to 4,822 acre-feet, the engineers found. As Colorado Springs development sprawls, the amount of impermeable pavement grows. So the city also is beefing up its long-underfunded Stormwater Division, increasing the staff of 28 to 58 full-time employees, mostly inspectors, and more than doubling the $3 million budget for compliance to about $7.1 million. The city and Utilities negotiated for nearly a year with Pueblo County, as Colorado Springs has beefed up its stormwater program to fix the problems and fend off the threats of lawsuits. The Pueblo Board of Water Works would like to see up-front bonding and longer term for an intergovernmental agreement between Pueblo County and Colorado Springs. Still, it’s probably the best deal possible, the board agreed during comments on the proposed deal at Tuesday’s monthly meeting. In February, the board provided its input with a resolution recommending certain actions to Pueblo County commissioners. Colorado Springs City Council approved the deal Wednesday, while Pueblo County commissioners will meet on it Monday. It provides $460 million for stormwater projects over the next 20 years, triggers $50 million in payments over five years for Fountain Creek dams and adds $3 million to help dredge and maintain levees in Pueblo. Board member Tom Autobee said the agreement is comprehensive, but was uncertain about the 20-year timeline for improvements. Board member Jim Gardner was assured by Gradisar that Pueblo County is guaranteed a voice in which projects are completed. “They have a priority list and can’t switch unless both sides agree, as I understand it,” Gradisar said. “This is a great opportunity to correct the issues,” said Mike Cafasso. Colorado Springs won’t need the full use of the Southern Delivery System for years, but some can’t wait for the $825 million water pipeline to be turned on. Pueblo County commissioners heard testimony supporting a proposed agreement with Colorado Springs designed to settle issues surrounding the City Council’s decision to abolish its stormwater enterprise after the county had incorporated it into conditions for a 1041 permit in 2009. Pueblo West joined the SDS project as a costsaving alternative to a direct intake on the Arkansas River downstream of Pueblo Dam. It shared in the cost of permitting and building the pipeline. Last summer, it used SDS when its own pipeline broke. Pueblo West’s main supply comes from the South Outlet Works and crosses under the river. The new break is more severe, Martin explained. An agreement reached last summer allows Pueblo West to use SDS before it is fully operational, and settled some lingering legal issues related to Pueblo West’s partnership in SDS. Security Water and Sanitation District, located south of Colorado Springs, also needs SDS to go online before summer, said Roy Heald, general manager of the district. “Security has an immediate need for water because there are emerging contaminant in our wells,” Heald said. Seven of the district’s 25 wells into the Fountain Creek aquifer were found to be contaminated earlier this year. The solution is to blend water from the Arkansas River with the well water to dilute contaminants. Right now, Security gets enough water from the Fountain Valley Conduit to make its supply safe. But in summer, water demands will increase, Heald explained. Larry Small, the executive director of the Fountain Creek Watershed Flood Control and Greenway District, said the agreement paves the way for flood control projects seven years after the district was formed. Small was on City Council when the stormwater enterprise was abolished on a 5-4 vote. He voted against eliminating the fee that was then in place. He was hired to run the Fountain Creek district two years later. The district has representatives from both Pueblo and El Paso counties. The district was formed by the state Legislature out of concerns about the effect of El Paso County’s growth on Fountain Creek and the danger that is posed to Pueblo. The $460 million for Colorado Springs stormwater projects over the next 20 years is needed to slow down Fountain Creek, but that doesn’t mean Pueblo would be protected. There are at least 18 projects south of Colorado Springs involving either detention ponds or dams that the district wants to get started on. That process would get a kick start with $20 million in the next nine months if the agreement is approved by commissioners and Colorado Springs City Council in the next week. Three more payments of $10 million over the next three years would follow under terms of the 1041 agreement. The city of Pueblo also would benefit from a potential $6 million in Fountain Creek dredging or levee maintenance projects that would cost the city only $1.2 million over the next three years. Pueblo Stormwater Director Jeff Bailey last week told The Pueblo Chieftain that the city has projects lined up, depending on how the funds are structured. A separate $255,000 project to dredge between Colorado 47 and the Eighth Street bridge already is in the works. It would be funded by Pueblo County, the Lower Arkansas Valley Water Conservancy District, the Fountain Creek district and the state. For Colorado Springs, SDS is a 40-year solution to provide water both for future growth and redundancy for the major water infrastructure it already has in place. Earlier comments to commissioners from Colorado Springs officials indicated only about 5 million gallons per day initially would flow through the SDS pipeline to El Paso County. It has a capacity of 75 million gallons per day. Colorado Springs Mayor John Suthers said warranties on the project kick in when testing on SDS is completed at the end of this month, however, so Colorado Springs also would like to see the pipeline up and running by next week. Pueblo County and Colorado Springs continue to negotiate over the 1041 permit for Southern Delivery System, but there has been no resolution of issues regarding stormwater control. Meanwhile, Pueblo West, an SDS partner, won’t jump into the fray. Colorado Springs Mayor John Suthers earlier this month laid out a plan to apply $450 million to stormwater projects on Fountain Creek and its tributaries over the next 20 years. Many of those projects would benefit Pueblo County as well as Colorado Springs, and Pueblo County would have a say in prioritizing the projects, Suthers said. The proposal is an attempt to make up for Colorado Springs’ decision to abolish its stormwater enterprise in 2009, and its failure to comply with state and federal stormwater permits. Pueblo County officials publicly were cool to Suthers’ suggestion, pointing out that negotiations on several points have been underway for nearly a year. Meanwhile, Pueblo City Council and the Pueblo Board of Water Works adopted resolutions supporting Pueblo County in negotiations. This week, Pueblo West Metropolitan District board member Mark Carmel attempted to get the board to weigh in on the negotiations, but other members of the board declined. Carmel said the 20-year timeline proposed by Colorado Springs is too short and Pueblo could still be at risk from flooding on Fountain Creek caused by growth to the north. His proposal was not considered by the board. “We need leaders who will not roll over and play dead to Colorado Springs; leaders who must remain vigilant to achieve a permanent solution to flooding before new SDS water magnifies the problem,” Carmel said. Jerry Martin, president of the Pueblo West board, said he is generally satisfied with how Colorado Springs has treated Pueblo West in SDS. Pueblo West became part of the SDS project in 2007, agreeing to take water from it rather than directly from the Arkansas River below Pueblo Dam as a backup to its own pipeline from the dam and as a way to increase capacity of its water system. 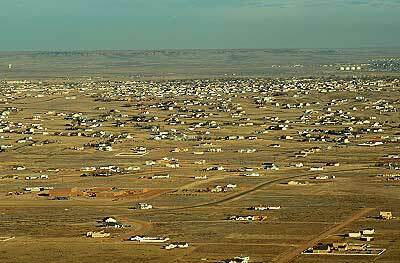 The agreement also designated Colorado Springs as the lead negotiator for SDS. Pueblo West has used its connection to SDS twice, once last summer and the other beginning last month, as a way to get water. Agreements signed in relation to that settled issues among Pueblo West, Pueblo County and the city of Pueblo related to water issues, but not the 1041 permit with Colorado Springs. A Pueblo West Metropolitan District board member wants Pueblo County commissioners to renegotiate the 1041 agreement for the Southern Delivery System. It’s a significant development because Pueblo West is a partner in the SDS water pipeline project, and has already benefited from an emergency use of SDS last summer. The metro board took a position on Jan. 12 that its water should not be held hostage during the current SDS discussions, but Carmel made it clear that he was speaking as an individual at Tuesday’s water board meeting. The metro board will meet with Colorado Springs Utilities at 5:30 p.m. Tuesday to address Carmel’s concerns. Both the water board and Pueblo City Council are pondering resolutions requiring more action on stormwater in relation to SDS. Pueblo County commissioners are in the process of determining 1041 compliance on stormwater and other issues in the permit. The Lower Arkansas Water Conservancy District has requested action by the Bureau of Reclamation under the federal SDS contract and by the Pueblo County commissioners under the 1041 permit to delay SDS until a stable source of stormwater funding is found. Carmel, a former Pueblo County engineer, said he has seen firsthand the damage Fountain Creek causes in Pueblo. He wants to make sure Colorado Springs has adequate stormwater control measures in place. “As Colorado Springs’ partner in the SDS project, I believe perhaps Pueblo West bears the most local responsibility to ensure SDS is implemented in such a way that the city of Pueblo does not get wiped out by floodwaters, in our name, if we stand by and do nothing,” Carmel said. He said politicians’ current assurance of $19 million in annual funding for stormwater improvements in Colorado Springs is not adequate because future councils could easily reverse the action. “A 10-year intergovernmental agreement is not worth the paper it is written on under the Taxpayer’s Bill of Rights, because it may be canceled at any budget cycle,” he said. Carmel said the 1041 agreement should be renegotiated to avoid future misunderstandings. The city of Aspen and Front Range water interests have reached a compromise 20 years in the making that allows more water to be sent east when the spring runoff is plentiful, in exchange for bolstering flows when the Roaring Fork River is running low in the fall. The deal is between the Twin Lakes Reservoir and Canal Co., which operates transbasin diversion tunnels underneath Independence Pass, and the city of Aspen and the Colorado River District, which works to protect water rights on the Western Slope. The deal, which has its roots in a 1994 water court application from Twin Lakes that sought to increase diversions during the runoff in high-snowpack years. It will leave 40 acre-feet of water in Grizzly Reservoir when Twin Lakes exercises its rights under the 1994 proposal. That water will be stored in the 500-acre-foot reservoir and released into the Roaring Fork for about three weeks in late summer, when seasonal flows are at their lowest. The water must be called for and released in the same year it was stored. Grizzly Reservoir, located about 8 miles up Lincoln Creek Road near the Continental Divide, is a component of the transbasin-diversion system. A tunnel underneath the reservoir channels water underneath the mountain to the south fork of Lake Creek in the Arkansas River basin, on the other side of the pass. Additionally, under the deal, the River District will have the right to store 200 acre-feet of water in Grizzly Reservoir and can call for up to 150 acre feet of that water in a year. Importantly, that 200 acre-feet can be stored long-term in the reservoir until it is called for by the River District, which manages water rights across the Western Slope. Another 600 acre-feet will be provided to the River District for seasonal storage in Twin Lakes Reservoir, also on the east side of Independence Pass. The district will then trade and exchange that water with various entities, which could lead to more water staying on the Western Slope that would otherwise be diverted through other transbasin tunnels. Twin Lakes diverts an average of 46,000 acre-feet a year from the headwaters of the Roaring Fork and sends it to Colorado Springs and other Front Range cities. The city of Colorado Springs owns 55 percent of the shares in the Twin Lakes Reservoir and Canal Co., entities in Pueblo own 23 percent, entities in Pueblo West own 12 percent, and Aurora owns 5 percent. Aspen and the River District intend to cooperatively use the stored water in Grizzly Reservoir to boost late-summer flows in the Roaring Fork as it winds through Aspen proper. The stretch of the Roaring Fork River below the Salvation Ditch on Stillwater Drive typically runs below environmentally sound flows each year for about eight weeks, according to city officials. And given that this spring saw a high run-off, the three parties to the agreement managed some water this year as if the deal was already signed. Aspen City Council approved the agreement on its consent calendar during a regular council meeting on Monday. The agreement is on the River District’s Tuesday meeting agenda, and Twin Lakes approved it last month. The deal still needs to be accepted by Pitkin County and the Salvation Ditch Co. in order to satisfy all of the details of the water court’s 2001 approval of the 1994 water rights application. In addition to its junior 1994 water right, Twin Lakes also holds a senior 1936 water right that allows it to divert up to 68,000 acre-feet in a single year and up to 570,000 acre-feet in a 10-year period. Originally, the water diverted by Twin Lakes was used to grow sugar beets to make sugar, but it is now primarily used to meet the needs of people living on the Front Range. The 1936 water right still has some lingering restrictions in high-water years, according to Kevin Lusk, an engineer with Colorado Springs Utilities who serves as the president of the board of the private Twin Lakes Reservoir and Canal Co. Under its 1936 right, when there is plenty of water in the Arkansas River and the Twin Lakes Reservoir is full, Twin Lakes is not allowed to divert water, even though it is physically there to divert, Lusk explained. So in 1994 it filed in water court for a new water right without the same restrictions so it could divert more water to the east. It was dubbed the “Twin Junior,” water right. The city of Aspen and the River District objected in court to the “Twin Junior” and the agreement approved Monday is a long-delayed outcome of the case. Aspen claimed that if Twin Lakes diverted more water in big-water years, the Roaring Fork wouldn’t enjoy the benefits of the high water, including flooding the Stillwater section and replenishing groundwater supplies. That process, the city argued, helps the river in dry times. “We don’t necessarily agree with the theory behind it,” Lusk said of the city’s claim, but added that Twin Lakes agreed to the deal as part of settlement negotiations. And since 2014 turned out to be a high-water year, Twin Lakes exercised its right to divert water under its 1994 Twin Junior right, and worked cooperatively with Aspen and the River District to release 40-acre feet of “mitigation water” as described in the pending deal. The new agreement between the city, Twin Lakes and the River District is in addition to another working arrangement between Twin Lakes and Aspen related to the Fryingpan-Arkansas diversion project, which diverts water from the headwaters of the Fryingpan River. That agreement provides 3,000 acre-feet of water each year to be released by Twin Lakes into the main stem of the Roaring Fork beneath a dam near Lost Man Campground, normally at a rate of 3 to 4 cubic feet per second. More Twin Lakes coverage here.